Sunny skies, calm winds and high water greeted anglers at the Professional Musky Tournament Trail’s Mercury Marine Summer Challenge qualifier on the scenic, musky-filled waters of the Eagle River Chain of Lakes in Eagle River, Wisconsin, June 23-24. Current areas turned out to be the big attractant for the muskies. 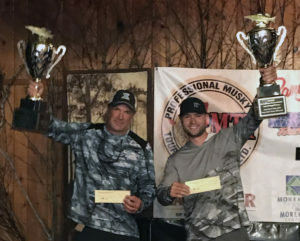 Bryan Schaeffer and Sam Ubl were champions of the PMTT qualifier on the Eagle River Chain. Forty-three muskies measuring up to 46 1/2 inches were registered during the annual two-day event hosted by the Eagle River Area Chamber of Commerce. Eagle Waters Resort on Eagle Lake of the chain hosted the event. The winning team of Bryan Schaeffer of Tomahawk, Wisconsin, and Sam Ubl of Mukwonago, Wisconsin, took the lead on Day 1 and built on it on the second day, catching a total of four muskies that measured 40 3/4, 39 1/2, 38 1/2 and 31 1/2 inches. Schaeffer and Ubl also lost five muskies, so you could say they had developed a strong pattern. They worked Lake X Lures Toads and burned in bucktails where current from the high water contacted shorelines, and ended up with muskies from three different lakes. Schaeffer and Ubl earned $18,000, trophies and two beautiful winner rings by Feldstein Jewelers. In second place were Chris Riebe of South Elgin, Illinois, and Matt Snyder of Tower, Minnesota, with muskies of 44 3/4 and 43 inches. They caught their muskies on an SS Shad and a Llungen Lure bucktail while fishing in shallow water near lilly pads and laydown logs. In third place was Ben Michlig of Minocqua, Wisconsin, and Matt Michlig of Milwaukee with muskies measuring 43 1/4 and 37 1/2 inches, also caught on Lake X Toad lures. Jeff Piazza of Lake Tomahawk, Wisconsin, and Mark Lijewski of Minocqua, Wisconsin, took fourth place with two muskies of 41 and 31 1/4 inches on jerkbaits off the first breakline. Rounding out the top five were Kreg Knoll of Menasha, Wisconsin, and Dylan Banker of Hortonville, Wisconsin, who worked bright-colored Medussas slowly. Their muskies measured 37 1/2 and 36 3/4 inches. 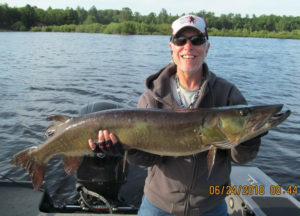 Howard Moshier of Fairfield, Ohio, caught the biggest musky of the PMTT’s Mercury Marine Summer Challenge, a 46 1/2-incher. Tournament Director Tim Widlacki thanked the PMTT’s sponsors, especially Mercury Marine, for sponsoring the tournament and the entire trail. Other sponsores included the Eagle River Area Chamber of Commerce, Ranger Boats, Musky Hunter Magazine, Keyes Outdoors, MotorGuide, Chaos Tackle, Vitaminerals, Feldstrein Jewelers, Morehead Tourism and all the associate and contributing sponsors. Next up for the PMTT is Musky Hunter Magazine`s Late Summer Showdown on Lake St. Clair August 11-12.